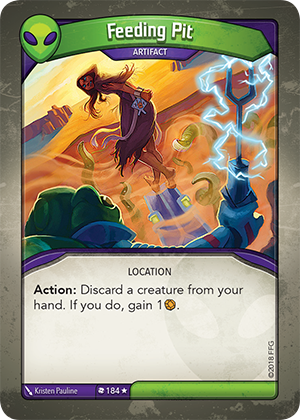 Card Text Action: Discard a creature from your hand. If you do, gain 1 . When using Feeding Pit’s “Action:” ability, may I discard a creature from any house? Yes. When resolving Feeding Pit’s “Action:” ability, you can choose to discard any creature from hand, regardless of the active house.